This is too cute! Last night, Dottie, John, Ann and Jerry all met for dinner. They were discussing my ‘future exciting dating plans’ and the ZENYATTA SCULPTURE that was done by Nina Kaiser. The prototype of the piece is photographed above with Stella and Violet. It looks like Stella is commenting to Violet how much she loves it. I DO TOO! Nina Kaiser is a very talented sculptor. She does beautiful work! Recently, she did the JOHN HENRY life-size statue that is at Santa Anita Park. 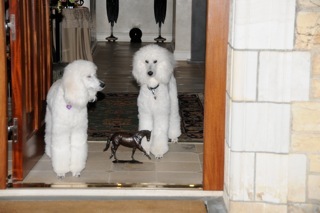 While I was at BARN 55, Nina would set up appointments with John and Dottie to come out and STUDY ME! She spent hours upon hours at the barn just observing me while I was training and out grazing. Nina actually measured every single part of my body and then took detailed photos of ALL of me! She wanted to be sure she could reproduce MY IMAGE in PERFECT SCALE! We spent a great deal of time together. This way, Nina felt she really KNEW ME and had a feel for how my body parts all flowed together when I moved. I also found it very interesting to note the keen observations of ‘an artist at work’ while she was with me! It looks like she GOT IT RIGHT! My TEAM absolutely loved her image of me…and I’M DANCING!! How fabulous is this! YEAH, NINA! As for my dating plans, I think this news will be released very soon. My TEAM reviewed all of the details with me this morning…and I’M SO EXCITED! I will keep you posted! What is Bernardini’s temperament like. Hard to know looking at him. He looks like a strong proud stallion. I am not even sure they take these things into consideration. Those who work in this field know more about this than I do, I am just learning. Okay…maybe he IS worthy…he is beautiful, though! Another heart-happy moment, thanks to you, Queen Z! Congratulations–your family made a most splendid choice!! Your boyfriend must have spoke to the paparazzi. Thanks for the link. The Mosses seem to be one-of-a-kind. I had no idea that the M in A&M records was Jerry Moss! The Mosses are so fortunate to have Zenyatta, and she is so fortunate to have them! While I wanted AP Indy, in the back of my mind I thought he was too old for her, and I believe stallions have their best ‘crops’ when they’re young. I am very excited about Bernadini! I felt strongly that her first foal should be called “Z Baby” but how can you resist “Zendini”???? I can’t wait to hear how/why they chose him. He had the best new crop in 2010. How exciting!! Hi, Cindy: There are O` so many miracles attending this story, the seeds of which have to do with that attitude of theirs — all of them — that if you`re willing to play, let yourself be surprised, and open to something miraculous, it can happen. They seem never to have proscribed for themselves or her & what a difference from the didactic norms institutionalized for keeping safe, in control, close to the vest, untrusting . .. David Ingordo`s story of how open John Shirreffs was with him — his thoughts on horses, training, all of it; same thing. So much fun, too .. . Mr. Moss speaks to that, that he wanted his artists to have fun while creating. Lots of ‘nothing but the best for us all.’ Khc. Methinks Bernardini is a good choice… good horse with a very nice race mare for his dam. And he does not appear to have the cryptorchid problem, though that can be passed down through a daughter as well as a son (it will skip generations). Seattle Slew had several monorchid sons who were (and are) sires… and some of the most interesting young stallions today are ridglings— such as Zensational, among others. Not to single him out, but he was the first one that came to my mind. This seems to be present in several lines, not just from Slew— and where did he get it? AKC and Arabian horses do not allow showing of males with retained testicles. Of course in the Thoroughbred the main criterion is “can it run?” with little negative attitude (other than the inconvenience of a likely surgery early in the racing career)— but now it’s so pervasive it would be pretty hard to delete from the breeding pool. In my experience cryptorchids can be very nasty tempered, probably because of hormonal imbalance — when corrected (either gelding or just removing the retained one) they usually show much better “social” attitudes. And are lots easier to work with. Someone said something about “breeding fees” income from Zenyatta— no, that is for stallions, not mares. And I hardly think the Mosses would sell ANY of her offspring, unless they had made the decision to sell ALL their horses. Zen is more than just special to them. And so will her foals be. Love the sculpture and the two sentinels. Most appropriate! The age of a stallion has little to do with his siring ability, given that he’s healthy enough to breed and still fertile. Several times leading sire Mr. Prospector sire his lone Kentucky Derby winner, Fusaichi Pegasus when he was around 26 years old. An older stallion may not breed as many mares and therefore not have the foal crop size of a younger stallion and therefore sometimes look to have a ‘drop off’ in foal quality but it’s usually more to do with having fewer than having ones ‘not as good’. Too Cute, Too Cute, Beautiful Girl! Stella and Violet are too cute to, the statue of you is too cute and you are absolutely and positively tooooo cute! I hope the stallion that has been chosen as your first beau is a perfect specimen – excellent conformation, intelligent, strong pasterns, no toeing in or out, knees, excellent throat latch, deep chest, a good engine – in other words a perfect and sound horse like Secretariat and you! He has to pass the muster! Then I’ll be happy for you! There WILL be a movie about this episode in our lives. It will start with her birth, her cheap yearling sale, John holding her back a year, her races, her detractors, her heartbreaking, yet convincing single loss by a nose, then her comeback win against Blame with her HOY win. The movie will end showing her racing progeny crossing the finish line first. And it will have a lot of time spent on how the Mosses single handedly changed horse racing forever. Yes, you are correct – there are “O so many miracles attending this story”! I just hope the time span for the movie is quicker than for those of Seabiscuit and Secretariat. Patricia said,”Love the sculpture and the two sentinels. Most appropriate!” ~ And, MOST ELOQUENT! Cindy ~ Laura Hillenbrand, with Gary Ross: both did Seabiscuit proud; a classic at its first printing, plus the context of his time in history. Rather done right or not at all .. . could hear the hoofbeats in your song. I write this with tears streaming down my face. Thank you for understanding how important Zenyatta is to so many of us. I am alive because of her. Your taking the time to do these diary post brighten my days beyond words and give me something to hold on to…Zenyatta…her story continues…God bless you all.